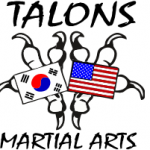 Our mission here at Talons Martial Arts is to create a well rounded individual, strong both in mind and in body, through the teaching of TaeKwonDo. It is also my goal to teach our students to set examples both at home and in the community by living life as the tenants of TaeKwonDo say to. Two classes required per week.Monthly fees $40.00 for first student, $20 for each additional family member after that. Other fees will include the cost of the uniform, sparing gear, and belt testing fees. Belt test-ing is once every few months. We have a Jr. Class for ages 4 to 6 then the student will be evaluated and moved to the regular class. Jr. students will learn the basic blocks, punches, etc. Regular classes are for students 7 years old and older. White, Yellow, and Orange are our beginner ranks. Green, Camouflage, and Blue are our intermediate rank belts. Purple, Brown, Red and Red with Black stripe are advanced belts. It takes about 3 years to gain your Black Belt level. We offer two free classes to see if you like it before you sign up. Come in and give it a try, we would love to see you.